This article is about the human mtDNA haplogroup. For the human Y-DNA haplogroup, see Haplogroup B-M60. In human mitochondrial genetics, haplogroup B is a human mitochondrial DNA (mtDNA) haplogroup. Haplogroup B is believed to have arisen in Asia some 50,000 years before present. Its ancestral haplogroup was haplogroup R.
The greatest variety of haplogroup B is in China. It is therefore likely that it underwent its earliest diversification in mainland East or South East Asia. Haplogroup B is now most common among populations native to South East Asia, as well as speakers of the Austronesian languages. A subclade of B4b (which is sometimes labelled B2) is one of five haplogroups found among the indigenous peoples of the Americas, the others being A, C, D, and X. Because the migration to the Americas by the ancestors of indigenous Americans is generally believed to have been from northeastern Siberia via Beringia, it is surprising that Haplogroup B and Haplogroup X have not been found in Paleo-Siberian tribes of northeastern Siberia. However, Haplogroup B has been found among Turkic, Mongolic, and Tungusic populations of Siberia, such as Tuvans, Altays, Shors, Khakassians, Yakuts, Buryats, Mongols, Negidals, and Evenks. This haplogroup is also found among populations in China, Indonesia, Iran, Iraq, Japan, Korea, Laos, Madagascar, Malaysia, Melanesia, Micronesia, Mongolia, the Philippines, Polynesia, Taiwan, Thailand, Tibet, and Vietnam. Although haplogroup B in general has been found in many Siberian population samples, the subclade that is phylogenetically closest to American B2, namely B4b1, has been found mainly in populations of southern China and Southeast Asia, especially Filipinos and Austronesian speakers of eastern Indonesia (approx. 8%) and the aborigines of Taiwan and Hainan (approx. 7%). However, B4b1 has been observed in populations as far north as Turochak and Choya districts in the north of Altai Republic (3/72 = 4.2% Tubalar), Miyazaki and Tokyo, Japan (approx. 3%), South Korea (4/185 = 2.2%), Tuva (1/95 = 1.1% Tuvan), and Hulunbuir (1/149 = 0.7% Barghut). This phylogenetic tree of haplogroup B subclades is based on the paper by Mannis van Oven and Manfred Kayser Updated comprehensive phylogenetic tree of global human mitochondrial DNA variation and subsequent published research. 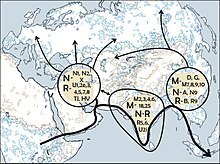 In his popular book The Seven Daughters of Eve, Bryan Sykes named the originator of this mtDNA haplogroup Ina. Wikimedia Commons has media related to Haplogroup B (mtDNA). ^ a b van Oven, Mannis; Manfred Kayser (13 Oct 2008). "Updated comprehensive phylogenetic tree of global human mitochondrial DNA variation". Human Mutation. 30 (2): E386–E394. doi:10.1002/humu.20921. PMID 18853457. Archived from the original on 4 December 2012. ^ a b Derenko, Miroslava; Malyarchuk, Boris; Grzybowski, Tomasz; et al. (2007). "Phylogeographic Analysis of Mitochondrial DNA in Northern Asian Populations". Am. J. Hum. Genet. 81: 1025–1041. doi:10.1086/522933. ^ Theodore G Schurr and Douglas C Wallace, "Mitochondrial DNA diversity in Southeast Asian populations", Human Biology, June 2002. ^ a b Jin, H-J; Tyler-Smith, C; Kim, W (2009). "The Peopling of Korea Revealed by Analyses of Mitochondrial DNA and Y-Chromosomal Markers". PLoS ONE. 4 (1): e4210. doi:10.1371/journal.pone.0004210. ^ Mona, Stefano; Grunz, Katharina E.; Brauer, Silke; et al. (2009). "Genetic Admixture History of Eastern Indonesia as Revealed by Y-Chromosome and Mitochondrial DNA Analysis". Mol. Biol. Evol. 26 (8): 1865–1877. doi:10.1093/molbev/msp097. ^ a b Starikovskaya, E. B.; Sukernik, R. I.; Derbeneva, O. A.; Volodko, N. V.; Ruiz-Pesini, E.; Torroni, A.; Brown, M. D.; Lott, M. T.; Hosseini, S. H.; Huoponen, K.; Wallace, D. C. (2005). "Mitochondrial DNA Diversity in Indigenous Populations of the Southern Extent of Siberia, and the Origins of Native American Haplogroups". Annals of Human Genetics. 69: 67–89. doi:10.1046/j.1529-8817.2003.00127.x. PMC 3905771. ^ Derenko, M; Malyarchuk, B; Denisova, G; Perkova, M; Rogalla, U; et al. (2012). "Complete Mitochondrial DNA Analysis of Eastern Eurasian Haplogroups Rarely Found in Populations of Northern Asia and Eastern Europe". PLoS ONE. 7 (2): e32179. doi:10.1371/journal.pone.0032179. PMC 3283723. ^ Soares, Pedro; et al. (2011). "Ancient Voyaging and Polynesian Origins". American Journal of Human Genetics. 88 (2): 239–247. doi:10.1016/j.ajhg.2011.01.009. PMC 3035714. PMID 21295281. ^ Trejaut, Jean; et al. (2005). "Traces of Archaic Mitochondrial Lineages Persist in Austronesian-Speaking Formosan Populations". PLOS Biology. 3 (8): e247. doi:10.1371/journal.pbio.0030247. PMC 1166350. PMID 15984912. ^ Msaidie, Said; et al. (2010). "Genetic diversity on the Comoros Islands shows early seafaring as major determinant of human biocultural evolution in the Western Indian Ocean". European Journal of Human Genetics. 19 (1): 89–94. doi:10.1038/ejhg.2010.128. PMC 3039498. PMID 20700146. ^ Friedlaender, Jonathan (2007-04-19). Genes, Language, & Culture History in the Southwest Pacific. p. 233. ISBN 9780198041085. ^ Ricaut, F.X. ; et al. "Mitochondrial DNA variation in Karkar islanders". Retrieved 16 May 2013.